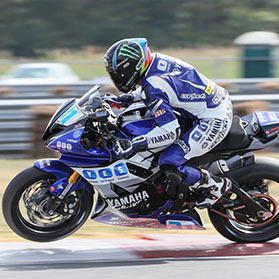 Graves Motorsports Yamaha R1 / FZ10 / MT-10 Diamond ™ No Cut Frame Sliders. Graves Motorsports frame sliders are designed to help protect your motorcycle in the event of a low speed crash or tip over. Graves Frame slider kits are engineered on the race track and have precise fitment. The unique Diamond ™ shape design of these sliders make for a sleek and innovative profile that keeps the protection of your motorcycle the #1 priority. Compare these with other brands' features or pricing and the clear winner is the Graves Motorsports. I like the product a lot and would have givin it 5 stars if it was 1/2"-1" taller. On the FZ-10 it looks like it will not protect the side cowling in the event of a lay down. This is disappointing and I hope I don't find out I'm right. The product looks great and fits the lines of the bike perfectly, but at the price point I would have expected complete piece of mind! Judging strictly on aesthetics, these Graves frame sliders for my R1M hit it out of the park. Beautiful! Hope I never need them, but if I do, I have a lot of confidence in Graves stuff. Best looking frame slider out for the fz- 10 right now! My only concern after installing is the length they stick out. Just not quite enough. I think an inch thicker would give the protection needed during a slide or tip over. Right now if my bike fell over I would need to replace the side fairing with these. Hopefully won't have to test but otherwise super awesome and very happy with purchase. Never buy round boaring sliders again! These are the coolest sliders ever. Really wished I had not tested these. They worked great to save the frame and radiator. I went down with these on my R1 at a track day. The bike was sliding for at least 100 feet. The bike was in pretty good shape and didn't "Catch and Roll" which i'm thankful for. Called up and got replacement pucks over the phone in 2 days! BEST sliders ever!